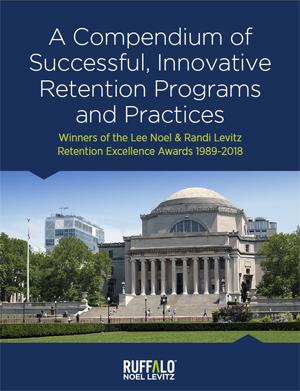 The Lee Noel-Randi Levitz Retention Excellence Awards program was established to honor the retention achievements of regionally accredited postsecondary institutions throughout North America. Established in 1989, there have been over 170 institutions recognized to date. The purpose of the Awards program is to identify and recognize the most successful student success and retention programs in use from a variety of institutions serving a diverse range of students, and to share those programs nationally. These award-winning programs serve as models of retention excellence and offer other institutional leaders opportunities to emulate these programs on their own campuses. Applications for 2018 are currently closed. This document contains case studies of more than 170 campus retention programs that have been honored with a Retention Excellence Award. The winner will receive a conference registration, recognition, and presentation session at the Ruffalo Noel Levitz National Conference; and will be a featured presenter in a national webinar hosted by Ruffalo Noel Levitz. Questions about the Retention Excellence Awards? Please email Janene Panfil of Ruffalo Noel Levitz.